The University Twinning and Networking program, or UNITWIN program1), has been supported by UNESCO since 1992. Universities that host the UNITWIN program aim to develop education programs for local students at partner universities under various themes from network to network. One of the program’s themes was ‘ICT in Education for the Development of Information Literacy and Leadership Education of Female Leaders’. 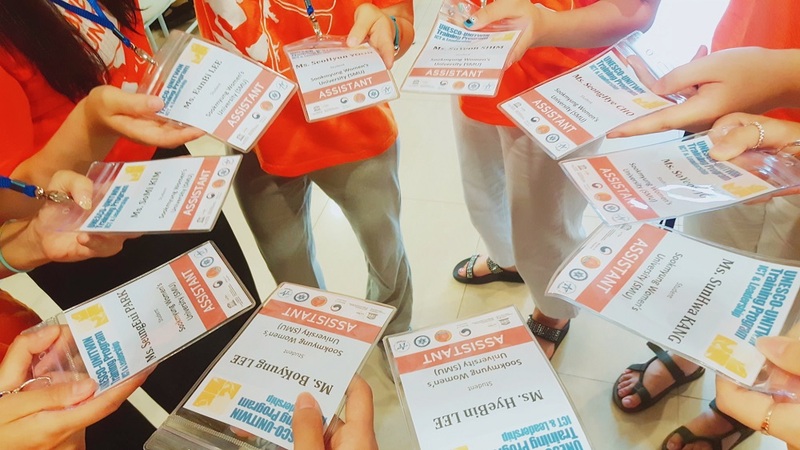 Sookmyung Women’s University works closely with its partner universities in Indonesia, Cambodia, and Laos, and this summer vacation, Sookmyung Women’s University dispatched student educators to four universities in Laos and Cambodia. I was sent to Royal University of Phnom Penh (RUPP) in Cambodia, where I worked for five days from July 30 to August 5. My initial motivation for the UNITWIN program was not inspirational. I merely saw a posting for the program on my department’s bulletin board. It also asked that students interested in ICT in education also be qualified to assist practical exercises such as using Arduino. Fortunately, during the second semester of my sophomore year, I participated in Prime Supporters and did as a mentor for the faculty of liberal arts ‘Coding Practice with Arduino'. It helps a lot. I am studying Information Technology and have often mentored others in the same major, so I thought I confidently applied to the program. After returning home, I completed an application right away. It was not easy to complete the application in just a short period of time, exam period, but I thought this to be one opportunity I should not miss. Luckily, I passed the interview part of the application process and was selected to RUPP. My typically meaningless vacations would be full of excitement this year. With this year’s summer hitting record-breaking highs, I expected it to be even hotter Southeast Asia, Cambodia. Cambodians do not like to show their skin, so I went through a lot of anxiety packing long sleeves and long pants. Reality was completely opposite to my initial thoughts. Before boarding my plane, I was caught off guard by the temperature of Phnom Penh on my smartphone. It said the temperature there was cooler than in Seoul. Throughout my entire stay in Phnom Penh, the temperature was cooler than Seoul. I had a fabulous time in Phnom Penh. It was a worthwhile summer vacation. Whenever Koreans hear Cambodia, most think of Angkor Wat, but my group of educators did not visit there. This was not a tourist visit, but a visit to do volunteer work in the name of Sookmyung Women’s University. Prior to leaving, the professor in charge of the program continuously told us not to forget we were the faces of Sookmyung, so we must do our best to participate in everything wholeheartedly. We were greeted by RUPP’s antique white campus our first day. I felt a sudden familiarity because I noticed a school banner hanging on the school gate welcoming us. Considering the climate of Southeast Asia, it was impressive to see that school corridors were open; that is, there were a lot of balconies and buildings were well-ventilated. Immediately after the opening ceremony, we started the training program. The program was structured around two central ideas: ICT and leadership. RUPP students who joined the program were required to take four days of lectures on each subject, prepare a group presentation that displayed knowledge of their learning in front of all other participating students on the final day. The winning presentations, one for each category, were invited to Korea to participate in another workshop, so students actively participated in the program and presentations. The 10 student educators from Sookmyung were divided into five fields. I was an assistant for the ICT category and supported students who made an AI Chatbot using Ruby, attended 3D printing classes, and participated in Arduino classes. Each day, student educators faced numerous obstacles. For instance, computers would stop suddenly or it would be hard to connect to the internet. One huge issue was the time when several computers got infected with a virus, so all the data on a USB was lost. This was very stressful moment. Two students brought their MacBooks, and every time an individual student asked a question related to their hardware, I found myself hectically rushing to find a solution, mostly because I was only familiar with Windows. I thought I would be only volunteering but I soon learned that I need to study, too. I also worried about my English ability. Could I effectively explain the idea in English? Luckily, I did not run into any huge communication issues because we had an interpreter with us at all times. For any SMT readers worrying about their English competency for this program, there is no need to panic. The UNITWIN had an interpreter readily available. Sookmyung Women’s University donated a 3D printer. Students who participated in the UNITWIN program had to only pay 200,000 won to participate and the Ministry of Education covered their airfare, meals, etc costs. The cost that we paid to join the program was the money used to buy the 3D printer. The shiny new 3D printer, when placed at the front of the lecture room, made all students’ eyes sparkle with excitement. "I want to print a model of myself in 3D. ", one student said. Regrettably, we could only print Arduino class models, not all students' works since we only had the one printer and it took a long time to print even a small item. According to one teacher, 3D printing education was only first introduced this year to the department curriculum. If the school uses the printer well and response to 3D printing education is positive, Sookmyung will donate more 3D printers during the next local training session and have student educators conduct more advanced classes. Moreover, if the 3D printing project outcome is positive, RUPP plans to establish a room filled with several 3D printers. My four days in Phnom Penh passed quickly, and I also became nervous when it was time to see a final presentation. All presentations were impressive. After the last presentation, the atmosphere became filled with expectation and tension when the professor stepped up to announce the winning presentation. Saying good-bye to Cambodian friends over lunch was saddening. I presented badges that had an image of Ada Lovelace, a famous English mathematician and writer and a great female role model, to my group members. I felt this was in line with the program’s theme of fostering female leaders through leadership and ICT in education. I was surprised because the group members gifted me a scarf and an encore-shaped key ring. It was really a meaningful gift. I posted it on Instagram with the hashtag, "We’ll surely meet again when you visit Korea." Both Cambodian students and UNITWIN student educators created long-lasting friendships. Group discussions over cup noodles in the evening are among the unforgettable memories. I would like to thank all professors in charge of the program and Yoo Jihee and Jang Eunji of APWINC who encouraged and supported me. During the second semester of this school year, we will come together again to make more memories. I am already looking forward to seeing you all again.